we all love fountain pens and we all want to write with them. So at one point we need to find ourselves some nice paper. In my case I also wanted a nice notebook which contains the paper. 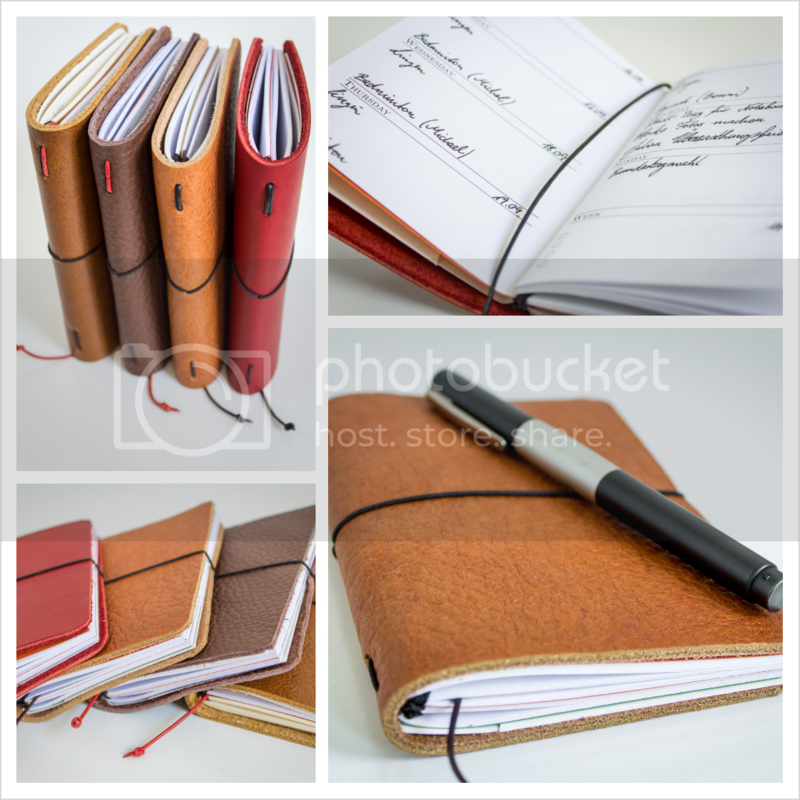 Eventually I discovered the Midori Notebooks and loved them. Simple design but a very thought through, cool looking little system. The problem that I had was the price. I just did not want to (and shouldn't at the time) spend 50$ for a notebook. So I had the idea to google a little bit and see, if there were people who made their own versions of that Traveler's Notebook. And I was lucky. I found this Youtube-Video, which explains in detail how to cut the leather and this website, which teaches you how to make your own refills and provides printable templates (if that's something you want to do). I could tell you myself how I did it, but I think these two sources are doing a pretty good job explaining everything. I just would repeating it here. I liked the passport-size, but I did not wanted to be dependent on Midori refills. So I changed the format in the way that now I can refill with small Moleskine or FieldNotes notebooks. After that, I bought some nice leather on ebay together with a cheap leatherpunch and was ready to go. Here are the first four I made. I must say, I'm pretty pleased with the end result and I hope you try it yourself if you have the time and the passion. It's also great as a gift if you can't or do not want to spent the 50$ or more and it comes with this special self-made charm. Wauw...very nice job! Can I ask what kind of leather you bought and from whom? I've been looking for leather here in Amsterdam and also on ebay but it seems so hard to tell what you are getting without actually holding it in your hands. thanks . I was lucky to find a german online-shop located in Berlin, which sells all kinds of leather. I got calf leather (because it was the only leather with a thickness of 2-3 mm) in 4 different colors and every piece for a reasonable price. Unfortunately the site is only available in german (http://www.lederversand-berlin.de). But they have an ebay-shop where they sell most of their calf leather (http://stores.ebay.de/jlx-leder). Edited by manoart, 16 October 2013 - 21:29. I have made a couple myself using a slightly different method but the end result was good as well and actually fun. What I really like about making your own Midori syle notebook cover is you can decide which size is best for you. I made one in a B6 size and another in an A5 size. Manuel, great job. The notebooks really look good. After seeing how nice these books turned out, I'm inspired to try it myself. Thanks for posting this! 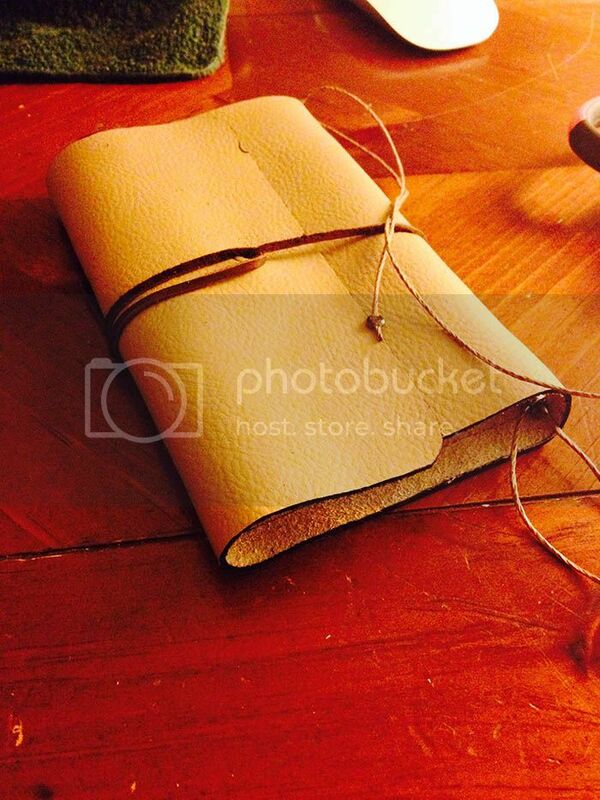 I've been wondering how to go about making a journal and finding leather. Your journals are beautiful, congrats! Manuel, well done. Oh boy, I own 5 Midoris myself and I am nuts for notebooks, doing myself some stuff out of old moleskine covers ripped the used paper off. Thanks for the online shop located in Berlin, will try their website. Manuel, one question, what kind of leather puncher do you use? Looking forward to a dropped line. The tutorial is wonderful, only one question: wouldn't the leather and other items required to make the journal cost as much as the original midori? I realize that it would be a value if youre making multiple, but would it be worth it to make just one? Thanks for the share! Goulet has the Midori covers (with minimum accessories) for roughly $50-60 each, plus shipping. An adequately sized hunk of thick leather will run $5-20 (depending on many factors such as species, tanning method, color and number of surface flaws) if one knows where to shop. An hour or two to trim, punch, thread the keeper and set up the product. Pay yourself $20/hr and, yes, it's the same or more cost as the original but out of pocket should be significantly less. But you get the satisfaction! If you're thinking about making your own Midori-style notebook cover/system, and you do not have one to deconstruct, be sure to make a model of very thick paper and load it with your refill or refills before you cut your leather; you need to allow for the bulk of the filler blocks and your personal tastes in in overhang, spare space for accessories or rounded corners. I definitely agree. You've done a beautiful job with them. Good point. Thanks for that tip. I repurposed a beautiful leather book cover made by Oberon that I’ve had for about 20 years. I used some beading elastic to hold folded pages. When I fill a signature, I remove it. Once I have a group of signatures collected, I will bind them in a simple way into a book to store on my shelf to which I can refer as needed. So far, I’ve not collected enough signatures in either the sketchbooks or the written journal. I’ve added heavy cardboard in the sleeves that would normally be for a notebook cover. This gives it extra support for writing. Edited by caitriona1066, 31 December 2013 - 07:38. I thought that too when I was first looking at unfinished leather. Then I got in touch with a leather merchant who pointed me to a leather factory here in Sydney - I'm in Australia - and I bought 3 beautiful off-cuts that cost me $2 each, a 1.5mm punch that cost $5.50, a bit of coloured elastic and ribbon from the $2 shop, and now I have 3 "Fauxdoris" in three sizes for under AU$20. It's incredibly satisfying. Those are very nice. Extremely well-done! I don't like the idea of using elastic—it gets weak and brittle and stretches out—so I'm going with hemp cord or something similar. Just a thought for others out there. For the four holes that need to be made to string the notebooks together, I reinforced them with eyelets. Aesthetically I like that a little better, plus it makes the holes less prone to wear and tear. I'd seriously caution anyone from just buying any old leather online and giving this a go. Make sure you know exactly what kind of leather you're looking for and specifically, how thick it is. You really can't tell very much from a picture, so inquire first is all. thanks a lot for your input and tips. I really like the design of your notebook. The overlapping sides are cool and the possibility to keep a pen in it as well is great. And the way you solved the lying-flat-when-writing-problem is also clever. Thanks again for sharing and keep it up . Hello! 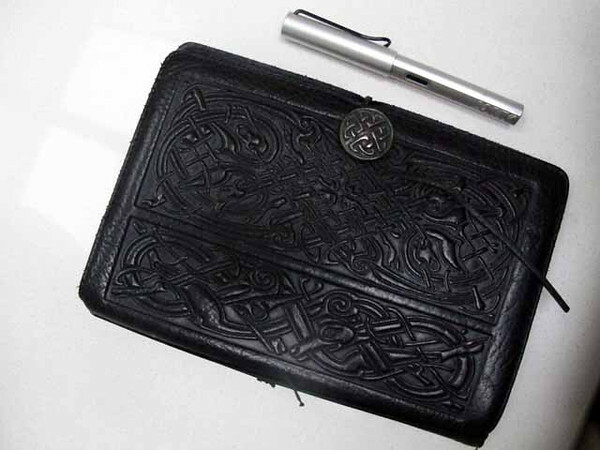 I realize this is an old post, but I'm looking to start making my own traveler's notebooks, and I really like the leather you used. I tried clicking the eBay link, but it only shows in German. I tried searching for the seller on the US eBay site, but couldn't find them. Is there anyway to buy from this seller from the US eBay site? Where are you located? I look forward to your reply! Thank you for sharing this! It's a great tutorial with great resources! Have an amazing weekend! I'm sorry, I'm new to this forum. Now I see that you are im Germany. Do you have any suggestions on where to buy leather here in the US? Or does anyone? Thank you! This website (https://www.theleatherguy.org) or Tandy leather is where I buy all my leather. I just saw, that the image hoster build in a paywall and I can't edit my initial post.